What all does it take to build a house? Today’s homes resemble multifaceted machines and the successful home builder has the knowledge, organizational skills and drive to build them. So, What does a home builder do? A home builder must understand how the home’s complex systems work, pay attention to detail, and coordinate various contractors in a team effort to build and sell a quality product. To coordinate this process, builders must think on their feet, plan ahead and do a number of tasks simultaneously. Above all, a home builder is a manager who guides dozens of skilled artisans and professionals, such as carpenters, architects, engineers, plumbers, electricians, painters, and landscapers. The home builder must know enough about each contractor’s trade to determine whether that contractor has done a quality job. The home builder, like a CEO, relies on a number of workers to get a job done right and has the authority to approve or disapprove of each employee’s efforts. Some home builders develop the land on which homes are built. In this capacity, they act as the land surveyor. They must look carefully at a piece of land to determine whether it complies with zoning regulations, local planning laws and environmental restrictions and whether it is suitable for development. In an attempt to determine what lies below the land’s surface, the home builder studies a lot’s topography, searching for rock outcroppings, shallow depth bedrock, shallow groundwater, natural drainage sources and dense vegetation. During this process, the builder also considers landscaping options and erosion control. Once the builder determines a site suitable for construction, they must navigate through the permitting process. 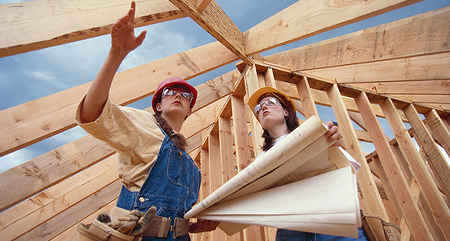 Home builders serve as liaisons with their communities and local government officials. They research and study local building codes to find out what they can build in which location. In most localities, building codes govern building, plumbing, heating and air conditioning, electrical systems, and fire safety. After studying the building codes, the builder collects permits from various authorities before proceeding with construction. Once through the permitting process, the builder can prepare the site, stake out the exact house location, get out the hard hat and start building. The home builder then oversees the entire construction process: laying the foundation; erecting the framing, roofing, and siding; nailing in the floor; building the walls, and installing in the exterior trim. And, the builder oversees the installation of plumbing, heating, and electrical work. A home builder also plays the role of inspector. Throughout the construction phase, the local building department checks the building site to search for code violations. But the professional home builder scours each construction site long before and after the officials show up to make certain each home he builds meets both code and warranty guidelines. Once the house is finished, the builder informs the appropriate municipal departments that it is ready for final inspection. One goal drives the professional home builder — a satisfied customer. To meet this objective, home builders act as public relations professionals. Content customers will recommend a builder to other prospective homebuyers, helping the builder’s business to grow. Home builders discuss the construction process and building schedule with their customers. They also plan times when the homebuyers can tour the building site and ask questions about the status of their new home. Who is Who in Ontario Home Building? 7 Questions to Ask Your Custom Home Builders in Toronto Custom Home Builder in Georgian Bay The Cost of Home Building – Dreaming of Building a New Home, but Worried About the Expense? Great introduction about home builders and their job! Keep sharing with us.